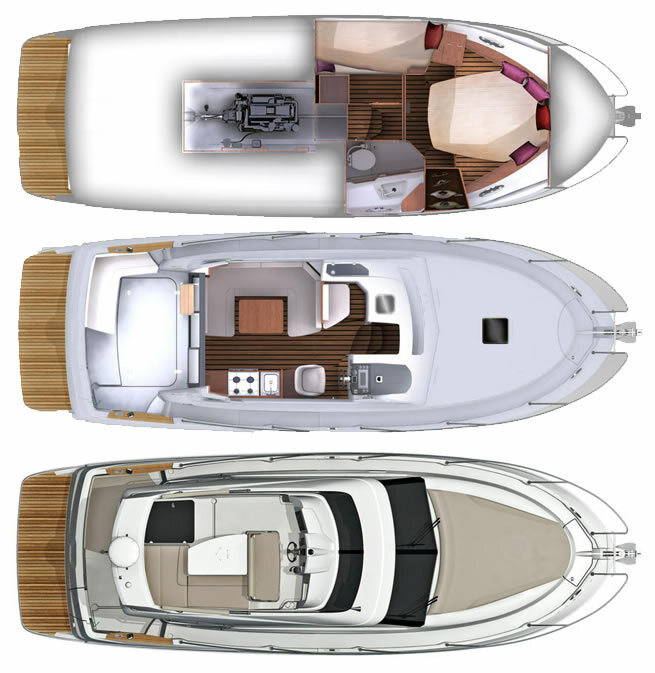 The Antares 30 features all the seafaring qualities on which the Antares reputation has been built and can adapt subtly to a broad range of sailing requirements. Sarrazin Design is famous for sleek elegance of line, and their style is unmistakable in this Antares 30. Its grey-tinted glass makes a special contribution to this sophisticatedly-modern design. 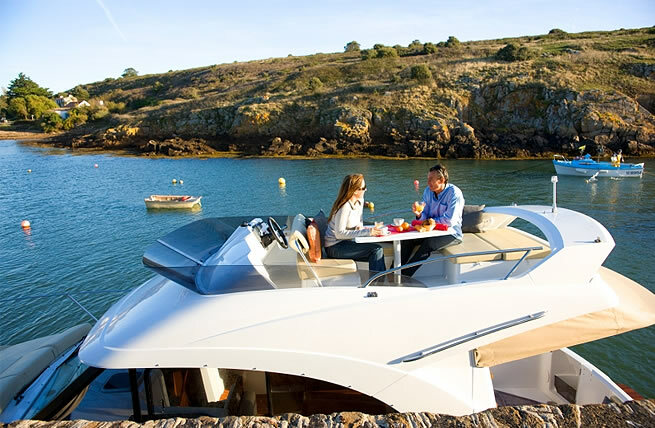 The hull is the work of the Beneteau design team, and is available in single-engine configuration. These 3 options make the Antares 30 a truly multipurpose boat. There is a capacious cockpit locker beneath the large cockpit and its (optional) bench seat. The convenient transom skirt and ladder make for easy access to the water and the quayside. The front deck offers a very comfortable sunbathing platform (optional). 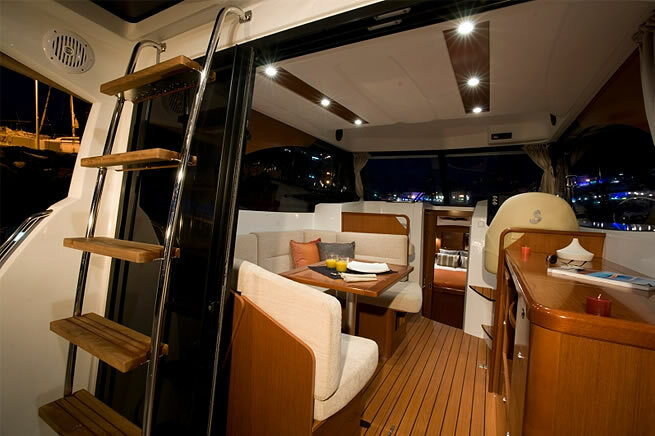 The flybridge layout is cleverly functional, with a comfortable saloon arranged around the table and double driving seats, which convert into a sunbathing platform. 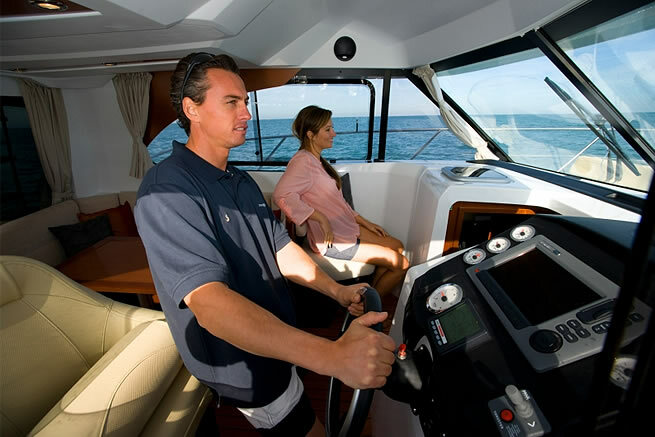 The double control panel (optional) is designed to receive Raymarine C90W electronics. Aft is the radar arch with integrated antennas. The wheelhouse interior is accessed via a 3-panel sliding glass door that creates a perfect feeling of space. 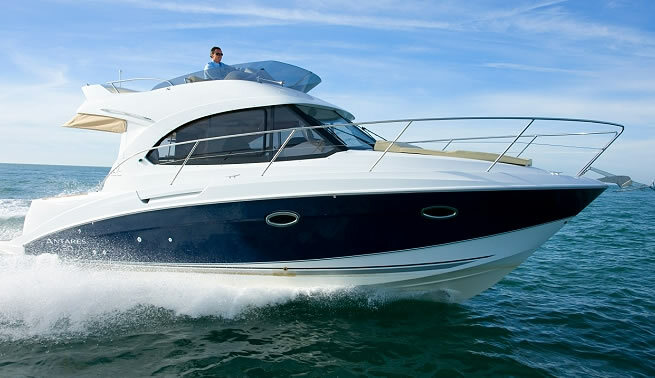 The amount of living space is unrivalled by any other boat of this size. The wheelhouse is large and bright for all-round vision at sea. The saloon converts to accommodate a double berth to port, whilst the compact, fully-equipped galley (gas oven, 65-litre fridge and microwave position) is to starboard. Moving further forward, the ultra-modern helm station features a bolster seat and Carbon Fibre-look instrument panel. Another major feature for a boat of this size is the comfortable forward-facing co-driver seat forward of the U-shaped saloon. Going below takes you to the cabins. 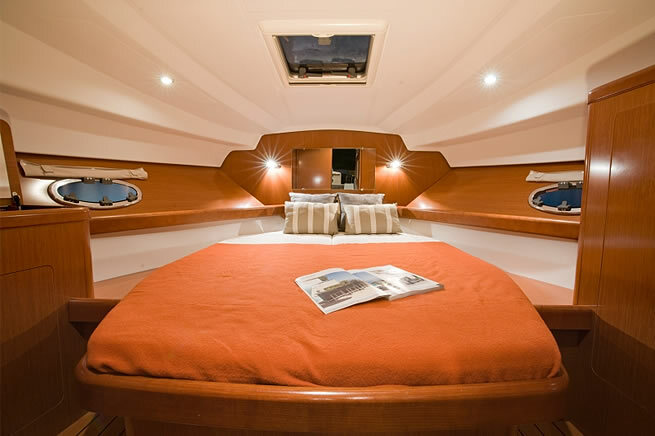 To port, the guest cabin offers two bunk berths and storage space. Right opposite, the washroom is very well equipped with marine WC (and 88-litre rigid holding tank), washbasin, shower and hull port for ventilation. The owner’s bow cabin offers a central bed measuring 1.98 x 1.40 metres mounted on struts to provide maximum storage space and access.